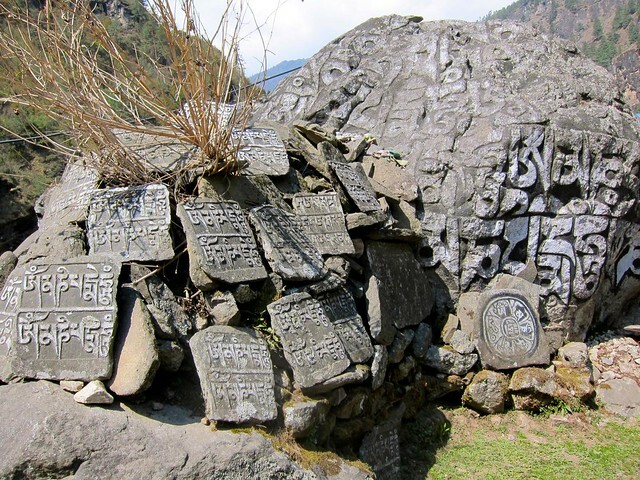 Everest Base Camp Trek, Day 2: Phakding to Namche Bazaar – snackettes. Today was one of those days that can only happen once in one’s lifetime: the day we got our first glimpse of Mt. Everest. 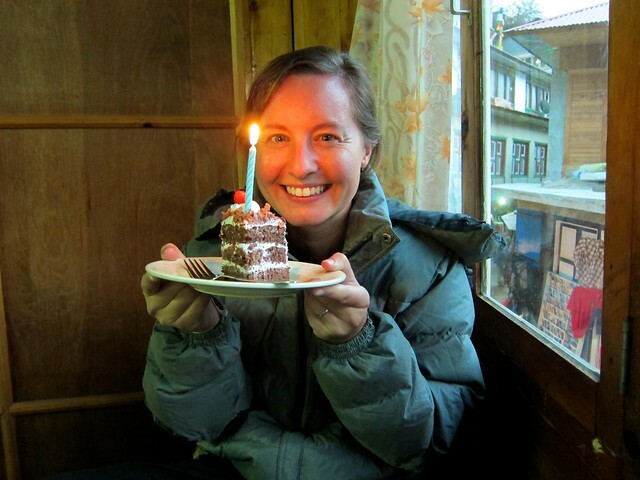 When we booked our airline tickets to Nepal over 6 weeks ago, our entire trip was planned so that we would make it to the first Everest viewpoint on this day, April 29 – my birthday. 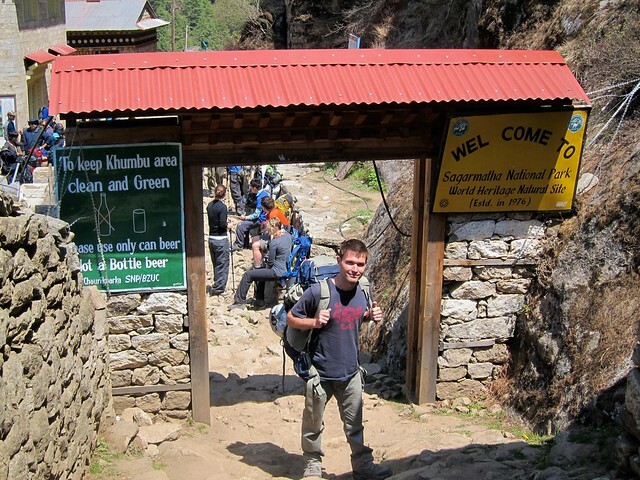 This second day of the EBC hike is infamous for being very difficult (the hike involves a “leisurely” 2.5 hour stroll at 8,500ft, followed by a grueling 4-hour near-vertical climb that ends at over 11,000 ft – with backpacks, in our case! ), and we were going to have to push through whatever hurdles we might encounter to make it to the viewpoint before sundown for a birthday celebration!! 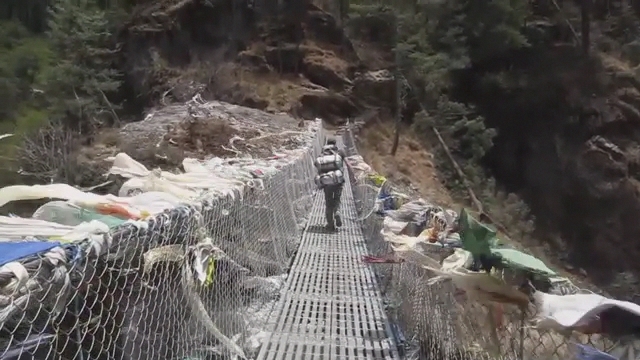 We set out from our lodge in Phakding at 8am on the morning of April 29th and bounded up the trail. We both had surprising amounts of energy to burn, and we were powering past other groups, left and right. 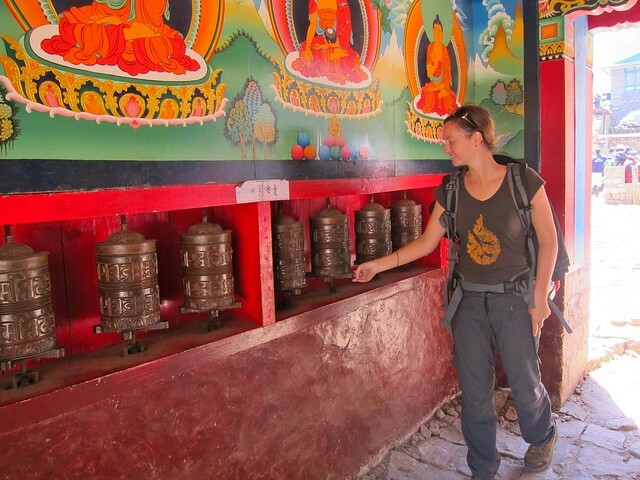 Feeling much lighter in our new garb, we were able to pick up our pace again and make excellent time to the Sagarmatha National Park entrance, near the village of Jorsale. 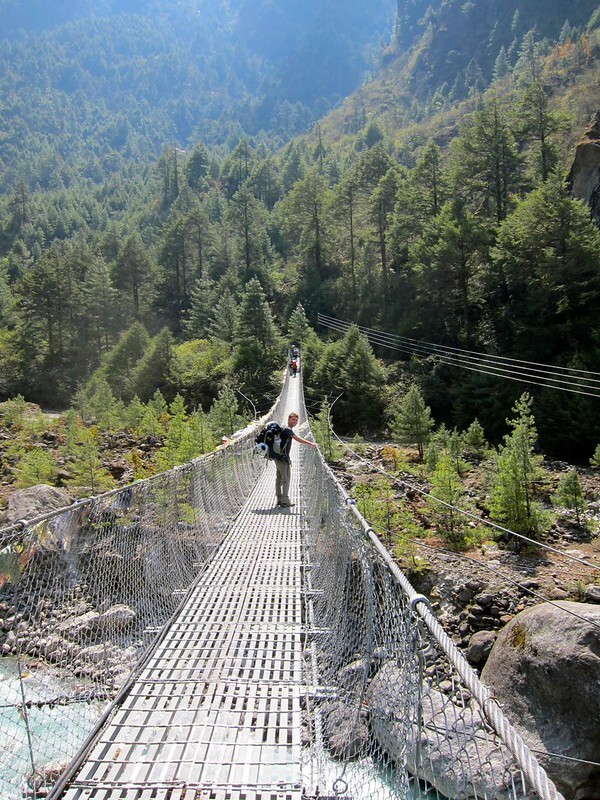 In addition to the ups and downs, the trail cut back and forth between different sides of the valley, connected by tall steel suspension bridges. 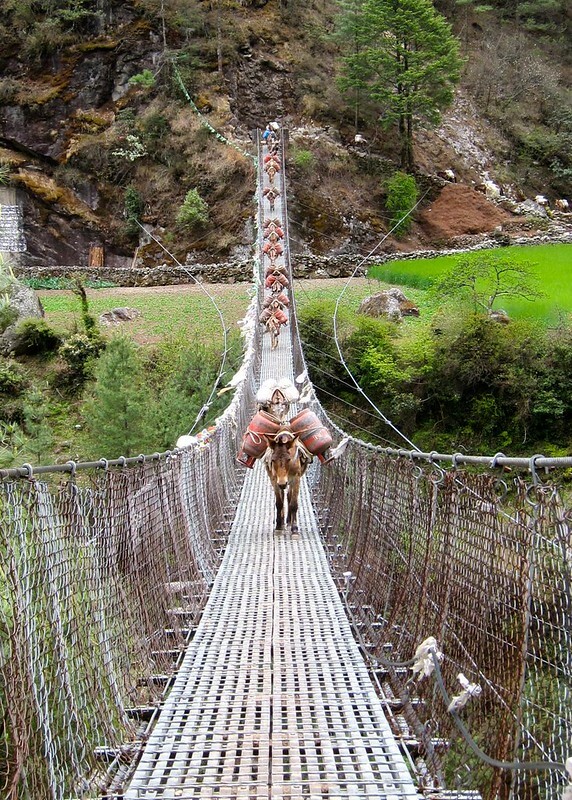 Between Phakding and Jorsale, we crossed at least 4 suspension bridges, which spanned several hundred feet above the river in places. The bridges were surprisingly well-maintained and felt safe, even with 10 fully-loaded donkeys (carrying gas tanks) coming at us! 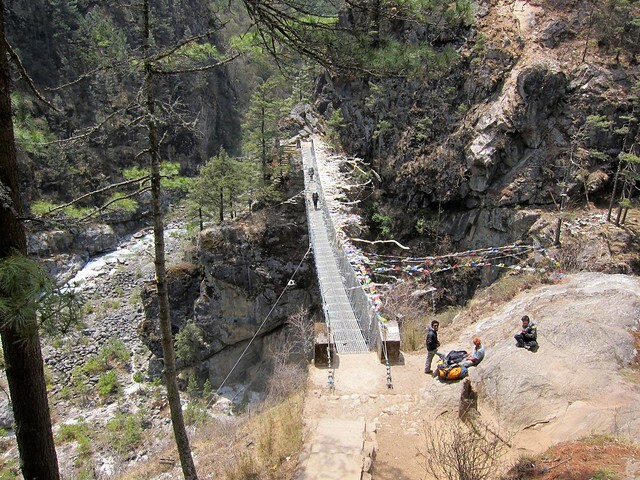 After stopping for a lunch of veggie momos (Nepalese fried dumplings) and milk tea, we passed over another suspension bridge that brought us to a fork in the trail. One direction was clearly meant to be the main trail, but the porters all seemed to be taking a smaller path to the side that looked like a shortcut. 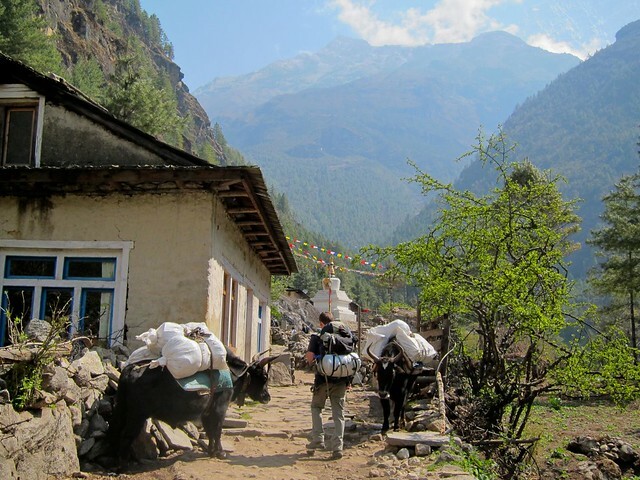 We thought about following the porters, but we reasoned that they were probably taking a longer, flatter side-trail to better handle their heavy loads and that we should stick to the main trail. 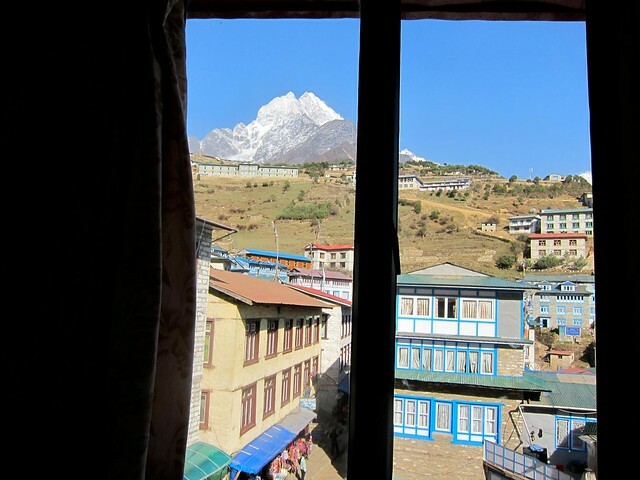 Additionally, our host at the lodge last night said that our first glimpse of Everest could be had soon after leaving Jorsale, and we were reluctant to miss out on the possibility of a viewpoint by taking a shortcut. 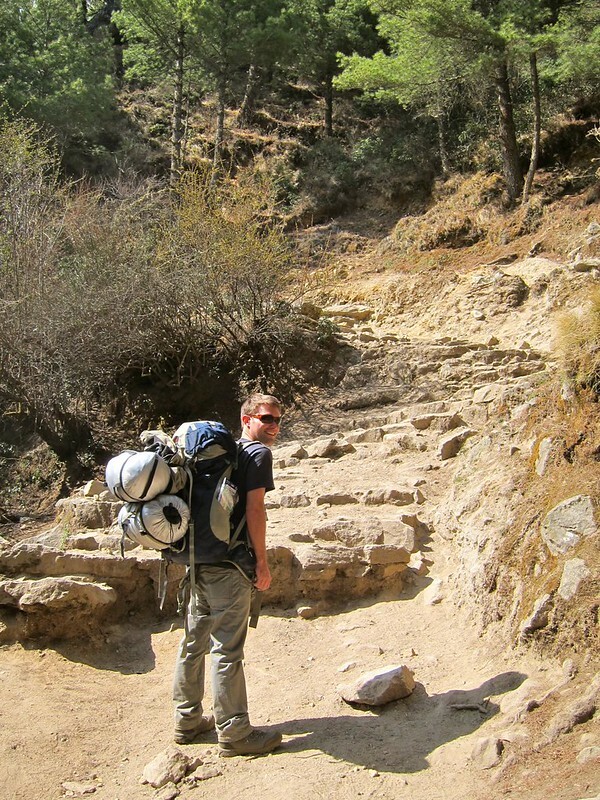 We started into the insane set of crumbling stone steps that lay ahead of us, while other trekkers hit the flat side-trail to our left. Ha! We’d show them when we’d see Everest first! Needless to say….. our decision was a huge mistake. The portion of trail we took was abnormally difficult and grueling: up for 100 feet, down for 100 feet; then repeat. With the prospect of seeing Everest keeping our spirits up, we dragged ourselves along the trail, looking in every direction for a tall mountain (problem was, they were everywhere). After 45 minutes of stumbling along, we met up with another trail– the same side-trail that we had elected not to follow. Although this time we had a perfect view of the shortcut along the side of the mountain (the one that we had just climbed up and over). The sidetrail was a perfectly flat, curving 10-minute shortcut that offered beautiful views of the river below. Happy trekkers that we had passed eating lunch an hour ago were now flying by us. Adding insult to injury, we hadn’t even seen Everest by going the other way. We crossed one final bridge and, looking up at the steeps ahead, we could tell we’d just finished the “leisurely” part of the day. 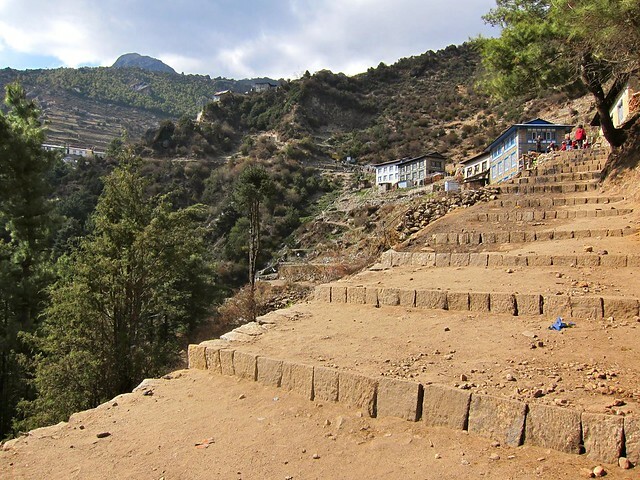 Now, we were faced with the real start to the uphill climb to Namche Bazaar, the “capitol” of the Khumbu region and (relatively) large trading post for people in the region. 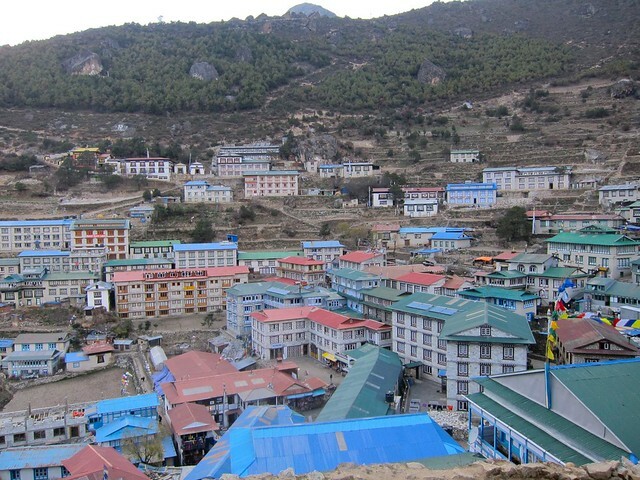 Namche is also home to the first official viewing spot of Mt. Everest along the trek…therefore, we’d need to make it there before sundown if we were going to make it in time for the b-day viewing. We began the 4-hour uphill climb at a decent clip, even following the porters up steep, tricky shortcuts to get around slow hikers. However, it wasn’t long before I found myself running out of steam. The climb we had just needlessly opted-into had sapped my last energy reserves for the day. We decided to split one of the Snickers bars from our small stockpile (which we had been trying to conserve) before continuing up the trail. Even with a little sugar boost, we were stopping every 3-4 minutes to rest. The air had already become noticeably thinner, and my legs would become exhausted after only a few stairs. Scott graciously volunteered to carry my sleeping bag for me, so we tied it onto his pack and continued to climb for a couple of more hours by taking a few steps, stopping to rest, and taking a few more. A few hours along, we stopped a young guy coming down the trail from Namche and asked him how much longer we had until we reached the town. “I just made it downhill from there to here in 10 minutes, so you can probably do it uphill in 20. You’re almost there!” Whether or not he was lying to cheer us up, we took his encouragement to heart and twenty minutes later, sure enough found ourselves stumbling into Namche Bazaar– or what we thought was Namche Bazaar– and had our passes stamped. 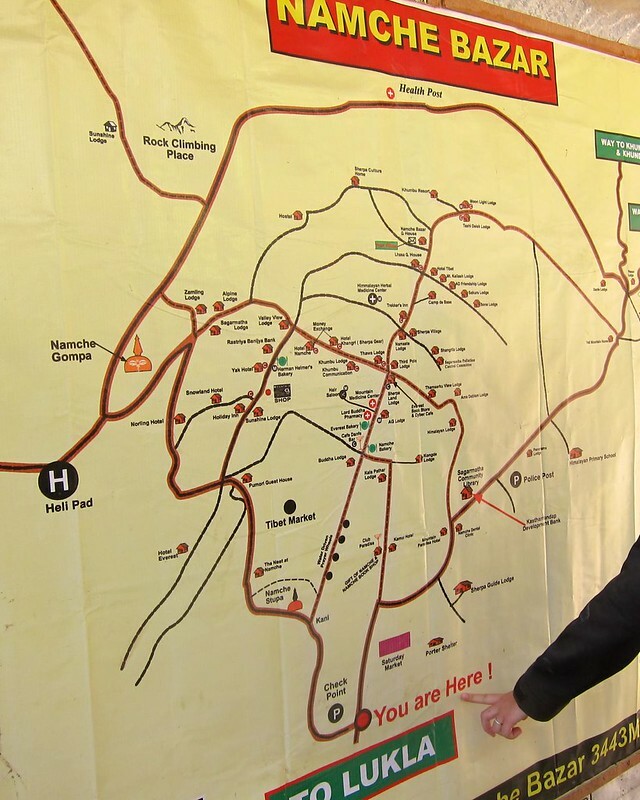 When I saw the map saying “You Are Here”, I nearly cried in relief. A few seconds later, I wanted to cry when I realized that the Namche outpost was still a long set of steps away from the village itself. 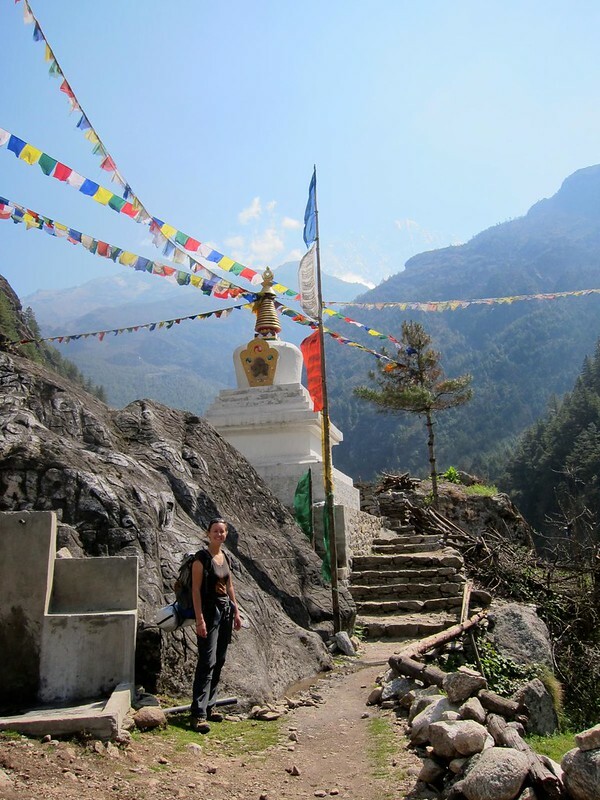 We began taking the final steps toward Namche one at a time and eventually made it to the edge of town. Suddenly, I started to feel dizzy from the altitude and had to sit down to rest. 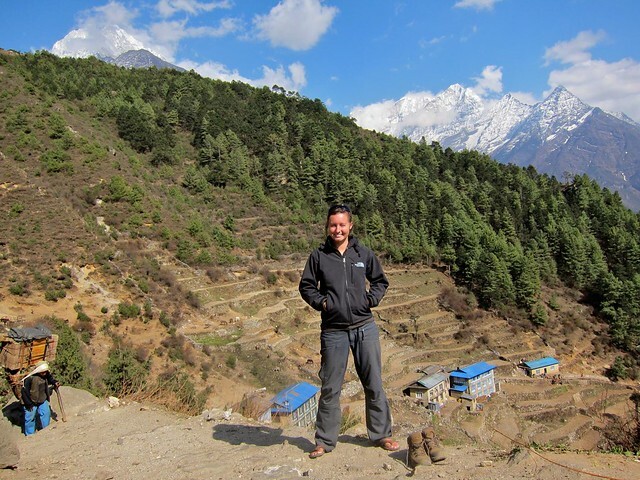 Being located at over 11,000 feet, Namche is often the first village along the trail where trekkers begin to experience altitude sickness, so we were purposely being overly cautiously. While I rested, Scott bought a Coke for me and then decided that he should carry not only my sleeping bag (which he already had) but my entire backpack, as well! Because I was ALSO getting blisters at this point, we decided I should change into my flipflops for the remainder of the walk to find a hotel. 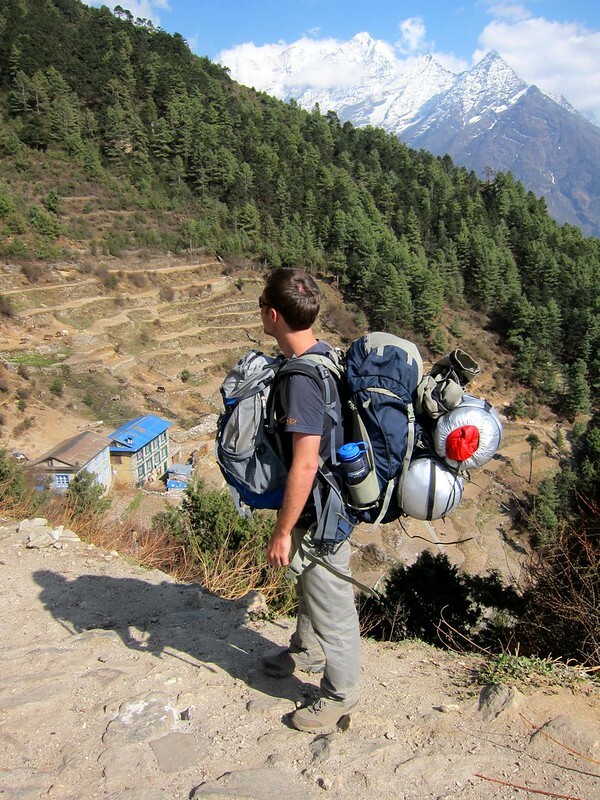 So I strolled into Namche Bazaar with no backpack, wearing flip flops, with a cold Coke in my hand. We easily found a hotel and collapsed into our room, utterly exhausted. 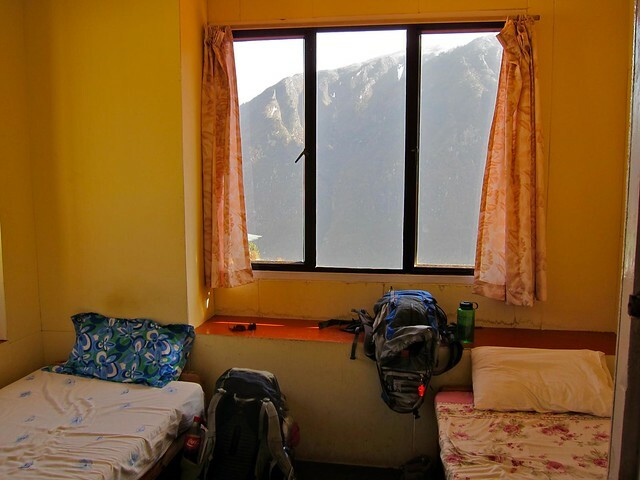 This room was similar to the one in Phakding (two twin beds, nothing else), but the price had already begun to come up (OK, $3 instead of $2…). “It’s gonna be amazing! Let’s go! !”, he said, literally dragging me off the bed. 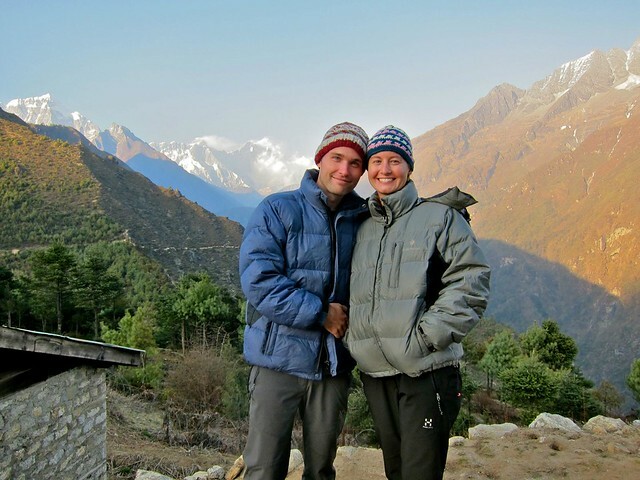 So we re-bundled ourselves in our winter gear and began what we thought would be a leisurely 5 minute walk up to the viewing point just outside of Namche. Twenty minutes of oxygen-deprived climbing later, we were approaching the grassy outcrop where the viewpoint was located just as the sun was preparing to set over the horizon. 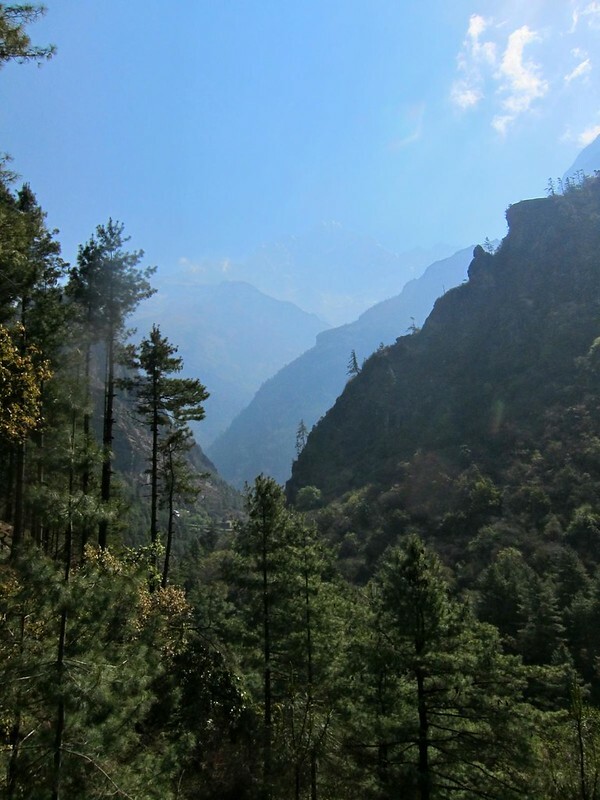 The angle from which we climbed up to the viewpoint was such that Everest would be at our backs as we made the last few steps to the outcrop…. We spun around together– Gray stone rising up to the left of Lhotse, with its iconic white plume of snow glazing off the summit– Mt. Everest! “Happy Birthday,” Scott whispered, as he gave me a huge hug. 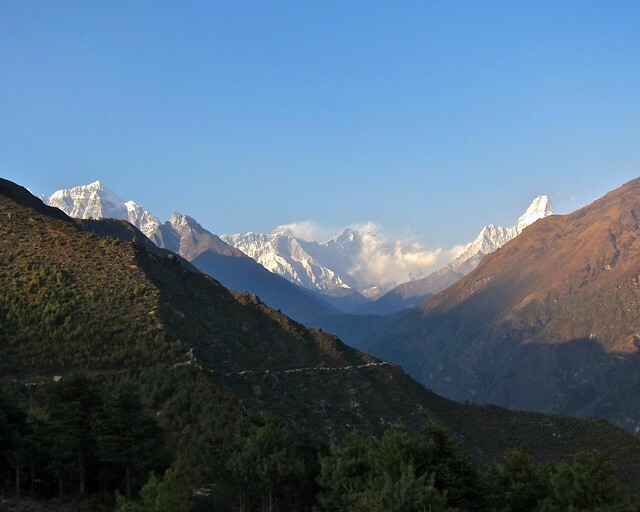 I should mention that at first, we were confused whether Lhotse (the 4th tallest mountain in the world, next to Everest) was actually Everest, since Lhotse was the taller, more imposing mountain in the center of our view, but a fellow hiker verified for us the real Everest, just to the left. Everest was still over 25 miles away and thus appeared less monstrous than some of the closer surrounding mountains. Knowing we’d get better views in a couple of days, we spent just a few minutes at the look-out and then headed back into Namche Bazaar to see what the town was all about. Surrounded by jagged, snow-covered mountains, Namche Bazaar was a colorful, well-maintained Sherpa village reminiscent of a tiny Swiss ski village, with rocky cobblestone footpaths and quaint stone chalets with red and blue and green roofs. 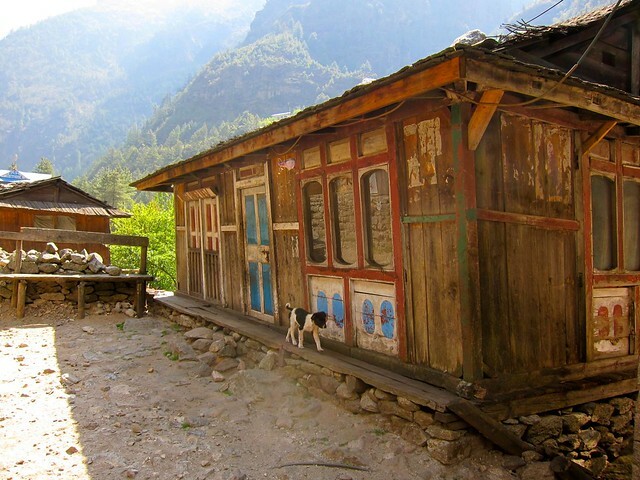 Most of the buildings were hotels; the remainder were trekking shops or restaurants, including (for better or worse) Namche’s very own Irish Pub, German bakery, pizza parlor, and Jamaican reggae bar. As we were finishing our last slices of pizza, I looked up to see a slice of carrot cake with a candle in it coming my way!!! Scott had arranged for our waiter to deliver the cake to me, and luckily, they just happened to have a candle in the restaurant. 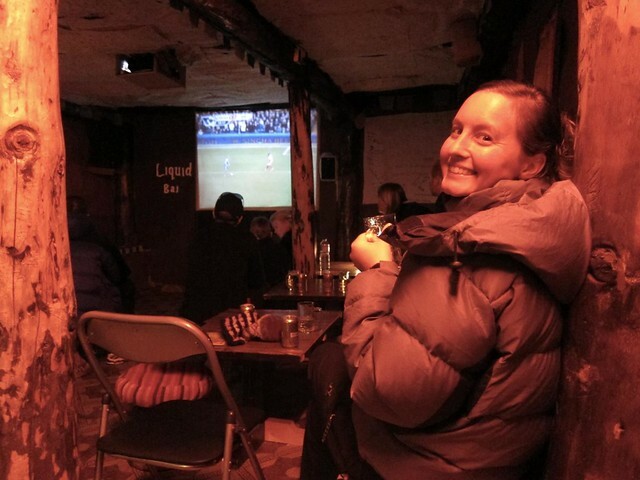 We finished the night with a couple of Everest beers at a little bar across from our hotel called Liquid Bar, which was a surprisingly hip cave-like bar with a few fellow trekkers gathered around a soccer match. We were too exhausted from the day’s events to stay out very long, though, and we quickly found ourselves buried inside our sleeping bags, fast asleep…. You guys really have it in you! Great, that you manage to slip out for such excursions every now and then . Thank you and I’m so glad that the post was helpful! I went back and read it myself just for kicks, and it was so great reliving the memory after almost a year back–so thanks for the reminder! :) Just take the hike slowly, and you will be fine! Unlike us, perhaps you will have a porter to help with your bags— that would make a tremendous difference. Good luck and enjoy! Hello again Steph! I just wanted to say that I made it! Thanks so much for your encouraging words, and you were right – I took it slowly (and yes, I did have the luxury of a porter and guide), and it didn’t take as long as I had imagined. What a relief! I topped off my trip with the most fantastic helicopter ride down to EBC (landing for photos), Kala Patthar, then Kongde (both landed for photos as well) and can quite honestly say it was the trip of a lifetime! Nowhere near as impressive as your fantastic efforts all the way to EBC, but for an unfit person like me, I was soooo chuffed. Thanks again, and I hope you enjoy many more happy adventures together!